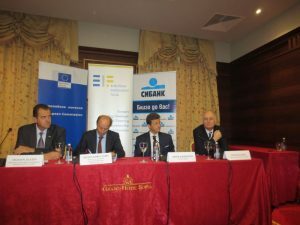 The European Investment Fund (EIF) and EIBANK signed the first agreement on the COSME program in Bulgaria with the support of the European Fund for strategic investments ceremony on 2.10.2015 . Programme for the Competitiveness of Enterprises and SMEs (COSME) is an EU mechanism for financing of SMEs with the support of the European Fund for Strategic Investment (EFSI) by the European Commission and the European Investment Bank in Europe. The agreement was signed by Mr. Alessandro Stoppers, Director of “Guarantees and microfinance securitization” in the EIF and Mr. Petar Andronov, CEO of CIBANK. Ministry of Economy of the event was attended by Ms Tihomira Palova representative of Bulgaria in the Committee COSME program to the European Commission. COSME is EU Programme for the Competitiveness of Enterprises and small and medium-sized enterprises (SMEs), in the period 2014-2020, with a total budget of 2.3, billion. COSME mobilize loans and equity investments for SMEs in Europe. Instrument credit guarantees COSME supports guarantees of working capital loans, investment loans, bank guarantees, leasing 150 000 for all SMEs. Guarantees focus on transactions with a higher risk profile.